Whether it's for a week or a weekend, Los Angeles, California is the perfect, post-marriage destination. Beverly Hills may be the neighborhood most often associated with Hollywood’s glitz, but nothing feels more classically SoCal than the palm-lined streets of Santa Monica. And if, like Sheryl Crow, all you wanna do is have some fun, look no further than the Fairmont Miramar, spread across a full city block at the corners of Ocean Avenue and Wilshire Boulevard. The perfect start to a romantic holiday begins under the property’s prominent fig tree — so large that the circular driveway curls around it. Inside, rooms rise up through two stout towers — the one with retro-deco styling has enviable sunset views — but we prefer the scatter of garden bungalows out back, constructed to feel like private casitas just steps away from the inviting pool. At 5 p.m., Fig, the Fairmont’s aptly named restaurant, offers half-priced menu items. Indulge in their signature bread balloon complete with Lebanese dips or the hand-selected cheeseboard from the resident fromagier. Then, head for drinks at Bungalow — also on site — where the throwback California surf vibe is perfectly articulated through estate-sale knickknacks, taxidermy, and woven ponchos. 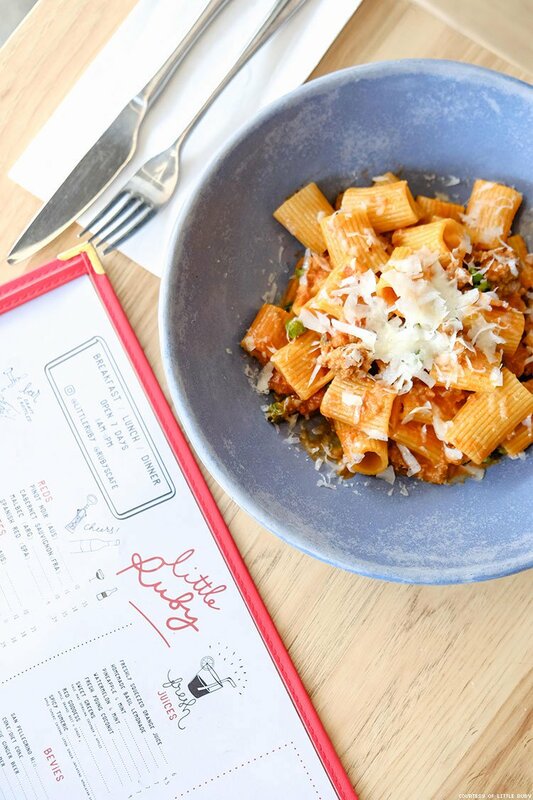 Street-side al fresco dining is a must when the weather is perennially pleasing; try Aussie import Little Ruby for savory egg-topped burgers and creamy flat whites. Mealtime gets turned into a memorable event at Dialogue, hidden speakeasy-style in a food court’s service closet along the Third Street Promenade. James Beard award-winner chef Dave Beran and his small-but-fierce army of sous-chef soldiers launch a staggered, two-seating culinary parade of 20 courses each evening that’s designed to play not only with tastes and textures, but bring emotion and wonder to the experience. The dialogue is meant to be between the diners and kitchen staff — separated by only a low-lying band of glass — as they prepare each thought-provoking bite inspired by art, sense memory, and the changing of the seasons (well, the seasons in other American cities). The menu changes every 12 weeks, taking on new inspiration and overarching themes, and, somehow, it’s all executed without pretension. 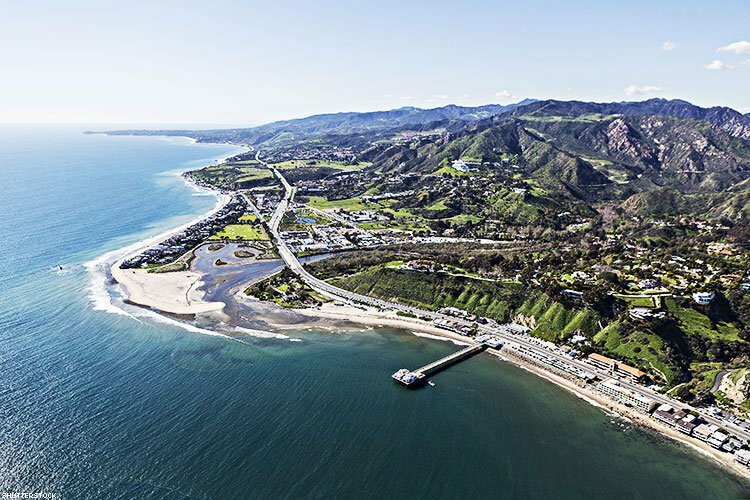 Long synonymous with #beachlife, Malibu is now the home of an especially compelling import — the ryokan. The art of Japanese hospitality is best encapsulated in the country’s traditional inns and their unwavering dedication to service. 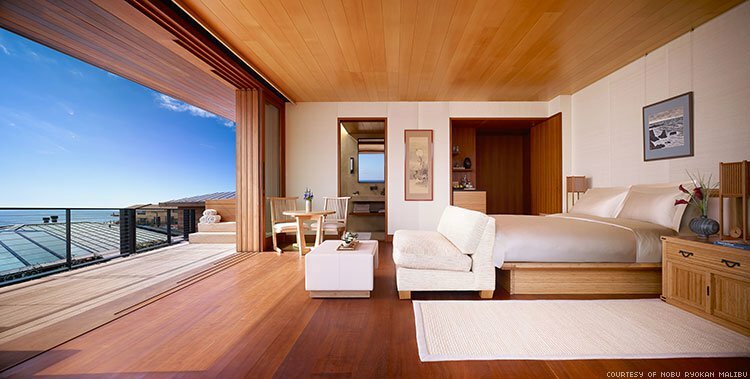 At the Nobu Ryokan Malibu, the white-with-blond-wood rooms are canvases on which a vacation dedicated to total relaxation is artfully painted. At the other end of the newly completed metro line, worlds away from the parade of perfectly planted palms, is Downtown Los Angeles — a warren of brick-lined warehouses and sheer glass towers. Once an industrial zone strangled by arcing interstates, the area now offers one of the most fascinating examples of urban regeneration, and a promising antidote to the languid vacationland found in the city’s West End. A score of accommodation options have recently flung open their doors in Downtown L.A. — with a few more on the way this year. And while each is poised to become a flagship property and Left Coast ambassador of their brand, our pick is the InterContinental Los Angeles Downtown, rising high above the the city’s tallest building. The hotel’s design draws its inspiration from Asia, where dozens of ultra-luxe stays are lofted at the top of commercial towers, their lobbies perched in the crow’s nest, with spacious rooms underneath. Furnishings are a nod to the East as well, with muted tones, natural materials, and a warm minimalism that will transport your senses to Japan. Looking down from your room, it almost feels as though you’re peering out over the bustle of Bangkok or Manila — with the city’s gleaming lights flickering like the switchboard of an aircraft all the way to the horizon. Go up to Spire 73, the tallest open-air rooftop bar in America, and sip a kumquat-infused Old Fashioned among high-rollers in the steel-and-glass aerie above the sprawl. Beyond hotels, Downtown L.A. is beefing up its commercial component too, led by Row DTLA. Reclaiming one of the last derelict quarters of the neighborhood, ROW is primed to become a patchwork quilt of cool by turning twice-abandoned factory floors into industrial-chic spaces inhabited by small batch cultivators. San Francisco’s much-lauded Tartine has plans to open an offshoot there; Virginia’s Rappahannock — the state’s choice oyster purveyor — will open a satellite space as well. Toss in coffee from Australia, a bar-top kaiseki from a young Japanese-American chef, a boutique of French-inspired curios, and startup-friendly working spaces, and you’ve got the micro-neighborhood of our dreams. Of course, there are plenty of nuggets unaffiliated with the regenerative gravity of ROW or the InterContinental. In the more pedestrian-friendly part of the neighborhood, near Pershing Square and South Broadway, pause to lunch at The Mighty, where no-frills counter ordering lures the working crowd with a variety of recipes from the California kitchen — from sandwiches and homemade pastas to our pick, the Thai-inspired fried cauliflower with singed peanuts. For dinner, try Inko Nito, an airy izakaya where fusion Japanese bar food is spun from a central robata hearth. Roasted sweet potato, a fall-off-the-bone hamachi kama, and open-faced nigaki sushi round off the list of favorites — they go down easy with an ume plum highball. And don’t skip the coconut soft serve for dessert; it’s an oddly satisfying umami bomb of salty-sweet flavors and silky-but-crunchy textures. The most unexpected find, however, is Lost Spirits Distillery — a stone’s throw from Row — where the chief distiller, the Willy Wonka of whiskey, has devised the most delightfully bizarre booze tour in a series of rickety warehouses. Drawing influences from Heart of Darkness, The Island of Dr. Moreau, and even a pinch of 2001: A Space Odyssey, the tour weaves the science of modernized hooch brewing into a sweeping narrative bolstered by robotic oddities won at auction from a bankrupt Rainforest Cafe. 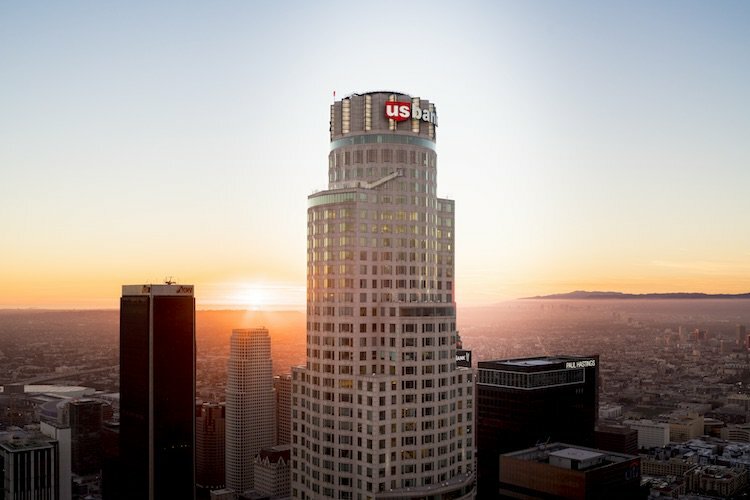 Finish your DTLA foray on a high note at the OUE Skyspace LA, the city’s version of the top of the Empire State Building. With a spacious observation deck divvied up into different zones — where you’ll find an interactive space dedicated to the Gilded Age of Hollywood and a hair-raising see-through slide tube that projects from the side of the building more than 1,000 feet above the ground — it’s a dynamic experience. Putting the “high” in high-end dining, its restaurant 71Above was built for special occasions with customizable three-course menus featuring excellent takes on oysters, dry-aged steak, and rich chocolate ganache.